Frank 'Dudley' Docker was a British industrialist and major benefactor to the Imperial Trans-Antarctic Expedition (1914-1917). Born in Smethwick, Birmingham, Docker was one of England’s foremost industrialists. In the planning for the expedition, local Birmingham businessman Frank 'Dudley' Docker donated £10,000 (c. £430,000 in today’s money) to Shackleton towards the purchase and refit of the Endurance. Shackleton named the Endurance's three boats after the three principal donors - the James Caird, the Stancomb Wills and the Dudley Docker. 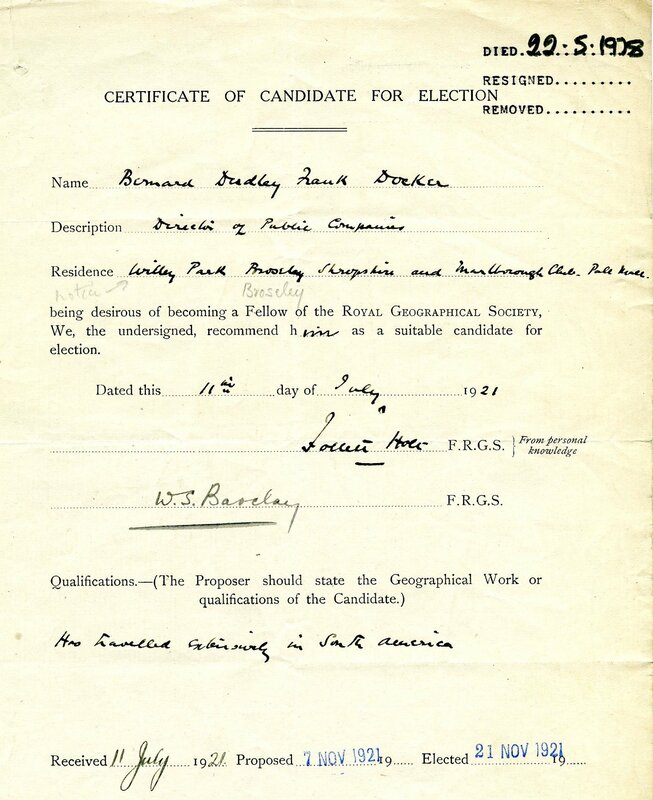 The Docker family pursued their interest in the pursuit of geographical knowledge following his involvement with the expedition, Docker’s son Bernard became a Fellow of the Royal Geographical Society in November 1921 and regularly attended meetings of the Society when he was in London. A copy of his Fellowship Certificate is shown below.